ASLEF drivers on Croydon tram will strike next Thursday, March 28th in dispute over pay. 04.11 & 04.26 Therapia Lane-New Addington; 04.49, 05.04 New Addington-Wimbledon. These will be the only trams to and from New Addington. No services at all between East Croydon and Elmers End/Beckenham Junction. Every eight minutes (15 before 07.00 and after 20.00) between Wimbledon and East Croydon only. 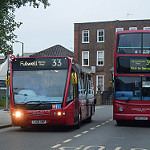 Are any replacement buses planned for New Addington? There is plenty of spare capacity on the 466 although that might be tested, there are alternatives on the Beckenham Junction/Elmers End branch. I would have thought a rail replacement type service might have been better especially for New Addington although there might be some uncertainty as to how many buses can be mustered? No rail replacement this time. 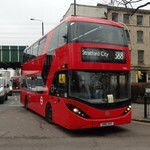 It will be extras, London spec buses with ticket machines. I was offered a shift on the 64, 289 or 466 but have a day job that takes priority! So far only the prospect of driving a Euro 2 Trident has been sufficient for me to book time off to work, but no chance of that sadly. The extras will only operate over the sections of those routes that parallel the tram and only in the AM and PM peak. The extra buses on the 466 won't be of much use terminating at Addington Village and I suspect that the 64 will be rammed. After the Sandilands crash Ensign were running extras on the 466 but going up into New Addington. London Tramlink: Trams are operating between Wimbledon and East Croydon only, approximately every 8 minutes. There is no service on the rest of the Tram network due to strike action. Tickets are being accepted on local buses. I should have paid more attention to this thread. My 664 was rammed this morning going through New Addington to the AVI! I think I had more ‘normal’ passengers than school kids!